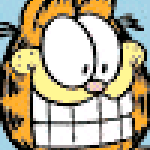 What if Garfield had the whole strip to himself? This webcomic pays tribute to, "Garfield-Minus-Garfield", with a little twist. The ComicFury conversion of,"Garfield-Minus-Arbuckle". Left on Who's Talkin' Now? Left on All is Well. Ha, these remind me of the Garfield randomizer.